Are ready and are being picked. Many say the best chiles in the world come from Hatch. Don’t believe it. The best chiles come from Mesilla. Just as soon as Bhut Jolokia is identified as the hottest chile in the world, someone steps forth to conquer it. Guwahati, India – A woman from India’s north eastern state of Assam is hoping to set a world record by eating a maximum amount of chilies in the least time. 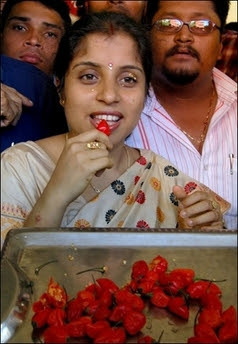 If successful, Anandita Dutta Tamuly will also be the world’s first person to eat a massive quantity of the world’s hottest peppers. Tamuly is extremely confident of besting the pepper, because she’s an experienced summiter already. The Assam government will pay for her trip to set the record. The previous world record appears to be 8 jalapenos in a minute, a pretty small bump compared to 60 Bhut Jolokias and a little Bhut Jolokia eyewash. One consequence of the chile’s new fame is its price is climbing. “We never thought Bhut Jolokia was so hot until news came in that this is the world’s hottest chilli. Now we have hiked the prices by Rs.50 a kg and people are buying it like hot cakes,” said Nalini Ram Thakuria, a vegetable vendor in Guwahati. In fall of 2006, the Guinness Book of Records confirmed that New Mexico State University Regentâ€™s Professor Paul Bosland had indeed discovered the worldâ€™s hottest chile pepper, Bhut Jolokia. 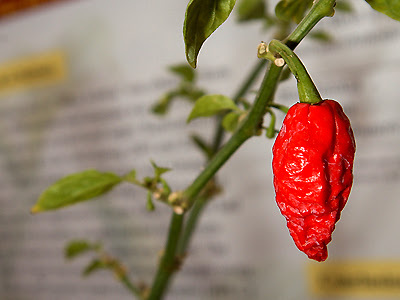 Bhut Jolokia, at 1,001,304 Scoville Heat Units (SHU), is nearly twice as hot as Red Savina, the chile pepper variety it replaces as the worldâ€™s hottest. A New Mexico green chile contains about 1,500 SHUs and an average jalapeno measures at about 10,000 SHUs. According to Bosland, Bhut Jolokia is a naturally occurring inter-specific hybrid indigenous to the Assam region of northeastern India. A member of NMSUâ€™s Chile Pepper Institute visiting India sent Bhut Jolokia seeds back to NMSU for testing in 2001. 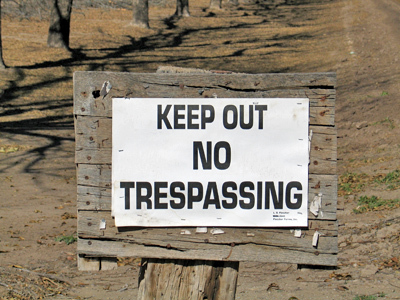 “The plant doesnâ€™t set fruit very well, so it took a couple of years to get enough for field testing,” Bosland said. Bhut Jolokia Chile — NMSU photo. The Scoville Heat Units scale for measuring pepper hotness is named in honor of Wilbur Lincoln Scoville, who invented the first method of measuring hotness. The hot substance in chiles is capsaicin. Pure capsaicin has a Scoville Heat rating of 15 to 16 million. The Chile Pepper Institute was established in 1992 and is located at New Mexico State University. 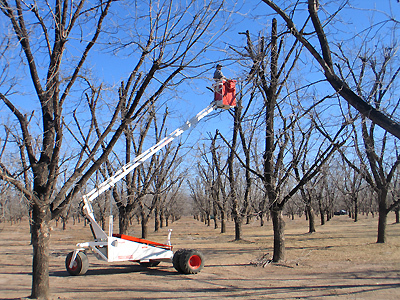 After the harvest, pecan growers have one last, big task — pruning the trees. 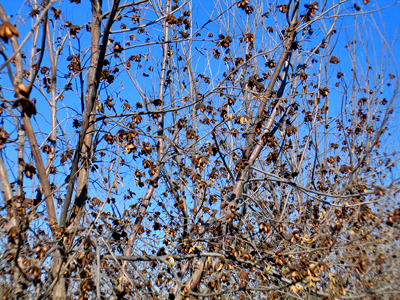 Pecan trees are pruned for several reasons. 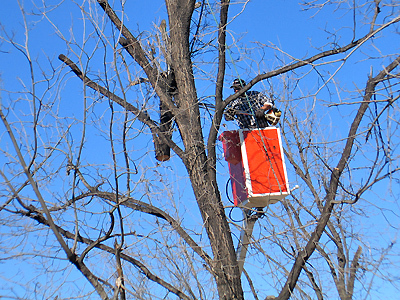 The main reason is to keep the trees smaller, which makes harvesting and tree care easier. 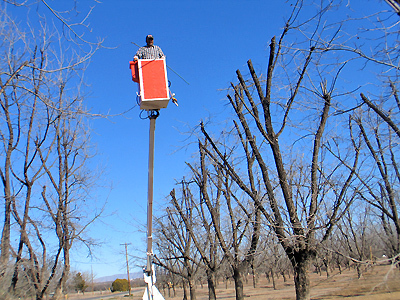 But pruning also helps increase or maintain yields and improve nut quality. 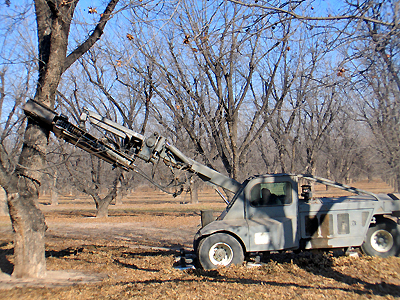 The operator can drive through the orchard and raise or lower the arm as needed. Pruning requires skill. 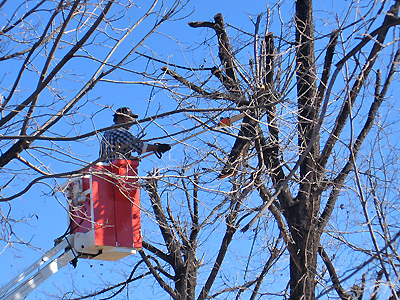 Trees must be cut in the right way, dead limbs recognized and taken out, and narrow crotches removed. 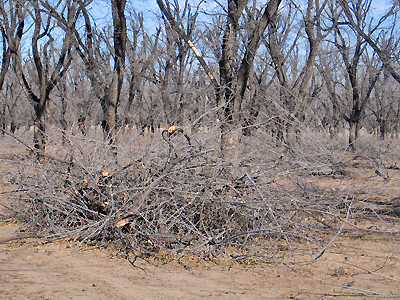 The prunings must be cleared so that they don’t interfere with the care of the trees or serve as a host for disease or insects. The prunings are first stacked, then hauled off and burnt. 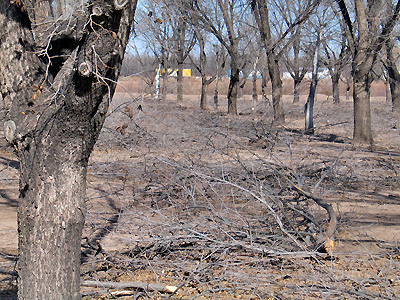 No viable economic use for pecan prunings has been found, so burning is currently considered the best disposal option. 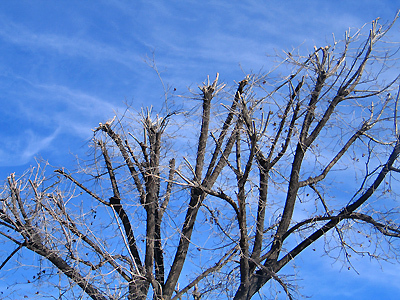 Until they began to leaf out and grow, pruned trees look buzz-cut. 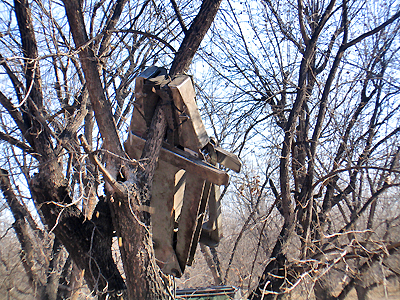 Why such concern about trees? They are not going to be damaged by people walking under them. The 2006 pecan harvest is almost finished. 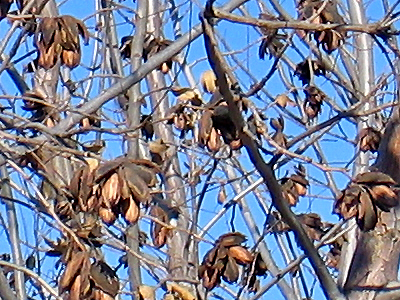 Pecan trees alternate between high yield and low yield years. This year is a low year for this area. Production in a low year can be as little as 1/3 of a high year. Here is a tree from an orchard with an excellent yield this year, perhaps because the trees are younger and were recently transplanted. 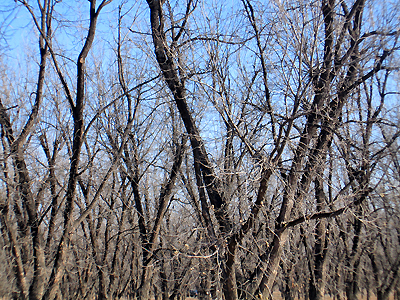 The trees are shook for about 2 or 3 seconds and you can feel the shaking in the ground 20 or 30 feet away. The going rate to get your trees shook if you don’t own a shaker is $5 a tree. Sometimes it is necessary to shake several branches of a large tree. 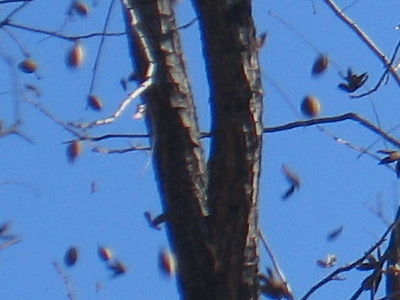 Here you can see pecans falling as the tree shakes. The shaker shakes out anything that will fall, including shucks, leaves, and twigs. All of this joins the leaves which have already fallen from the tree, so the second step is to use a windrow machine to rake this material into rows. 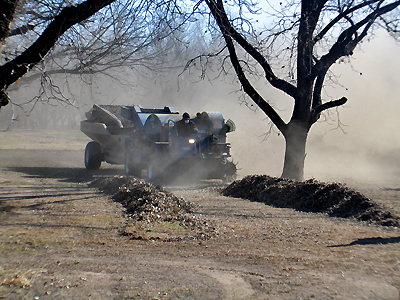 The last step in harvesting is to use a sweeper to pick up the leaves and debris and pecans and separate the pecans. Here’s a sweeper in action. 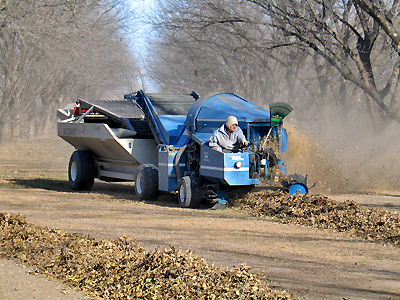 The sweeper stores the nuts in a bin and grinds the leaves and debris and returns it to the soil. Here are what trees look like after harvest. 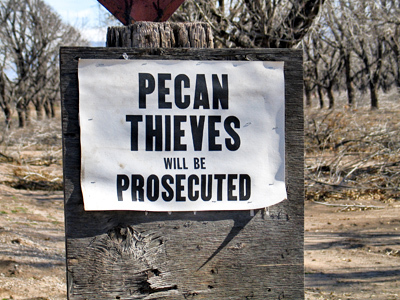 DoÃ±a Ana county produces more pecans than any similarly-sized area in the world.